Old Mahabalipuram Road or OMR as it is popularly known, has grown rapidly over the last decade. The transformation from being just the outskirts of the city, to becoming Chennai’s IT and Technology hub has been nothing short of remarkable. Fuelling this growth has been investment-friendly policies and the promotion of the area as a world-class tech destination. Many large IT/ITES companies like HCL, TCS, Accenture, Wipro, Hexaware, Cognizant and Infosys now call OMR their home. This in turn has spurred a demand for housing in the vicinity and has led to the development of OMR as a residential hub dotted with shopping malls, premier educational institutions, reputed hospitals, restaurants and entertainment zones. Properties in the central/prime locations of Chennai have become out of reach for most people due to exorbitant prices. In such a scenario, OMR provides high quality residential villas and apartments at affordable prices, starting at just Rs. 3350 per sqft. Projects by reputed builders on OMR have all the modern features and amenities, sophisticated architecture and premium specifications that one would want to have in a dream home. Having amenities like a gym and swimming pool within an apartment community help save a considerable amount of money on memberships as well as on conveyance costs in the long-run. Add to this the advantages of getting the opportunity to mix and mingle with one’s neighbours, having a better social life and staying fit. 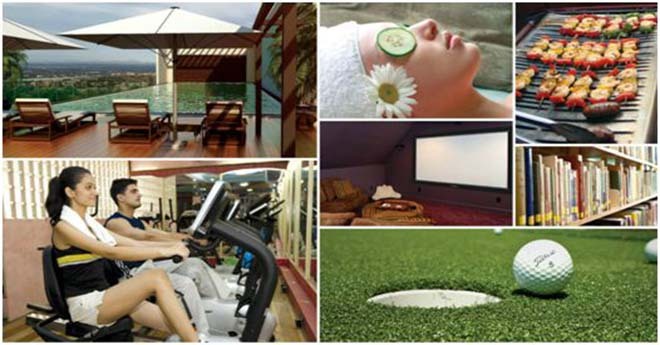 Real estate developers across OMR have understood the need to be innovative and come up with new and exclusive amenities apart from just clubhouses, fitness studios and swimming pools. Some communities like Casagrand Pavilion have as many as 60 lifestyle-enhancing amenities including an amphitheatre, movie room, billiards room, volleyball courts, cricket nets and children’s play area – to name just a few. With land in the central locations of Chennai scarce and coming at a premium, it has become nearly impossible to get amenities of this scale in homes within the city. The presence of multiple supermarkets, shopping malls and multiplexes like AGS Navalur in close proximity adds to the convenience and makes life easier for residents in the area. The entire stretch of OMR from Madhya Kailash to Siruseri, spanning Perungudi, Thoraipakkam, Karapakkam, Sholinganallur, Semmencherry, Navalur and Egattur enjoy seamless connectivity with the rest of the city. Bus and suburban rail services are convenient and the proposed rail line from Chennai to Pondicherry and Cuddalore, through Sholinganallur, Kelambakkam, Thiruporur and Mahabalipuram, will be an added boost to the connectivity of OMR. Also, with a large number of offices and major educational institutions situated along the stretch, the need for long-distance commuting is greatly reduced, improving the quality of life and increasing the time spent with friends and family. Apart from being away from the city hustle and bustle, OMR is also lined with scenic backwaters, beautiful roads, and fresh air that provide a serene living environment to dwell in, especially after a hard day at work. Also, not too far away is the scenic coastline along the East Coast Road (ECR) offering breathtaking sights of the sea. ECR is currently well connected to OMR through multiple link roads. Also in the pipeline, are two more link roads planned at Neelangarai and Pallavakkam, which would further enhance connectivity with ECR and other parts of the city. Owing to its growing prominence as a residential and commercial hub, OMR has constantly attracted interest and investment from multinational companies, real estate developers, home buyers and investors. Real estate prices along the stretch have appreciated about 50% in the last three years alone and 80 – 100 times in the last decade. The change of guard in the central government has buoyed the economy and signaled a spurt in IT activity in the area which is a good sign for real estate development. Further price appreciation is expected as a result of this, giving property investors a good return on investment. Perhaps, the biggest developments planned for the corridor are the proposed 1500-acre township for Japanese investors in Thiruporur and an elevated expressway all the way up to Mahabalipuram. The first phase of this expressway between Madhya Kailash and Siruseri is expected to be completed in the next six months. With development on in full swing and state government policies continuing to be investor-friendly, the area is sure to attract more investment and spur further growth. With an increase in real estate prices in Chennai expected, now is the best time to book your dream home and OMR would be your ideal destination. Now that you would have more-or-less made up your mind to choose OMR for your dream home; if you are looking for residential apartments and villas with modern amenities, comfort and space, do checkout some of Casa Grande’s current projects and upcoming projects in and around this location.